Yesterday my sister Jean and her family had to bid farewell to their son Kevin who came into their lives over 17 years ago. While Jean was expecting Kevin, she was told that he would never make it to birth. But, live he did for over 17 years! He survived many illnesses and incidences through those years but for the past four years he enjoyed relatively good health. This time, he was not strong enough to fight off the pneumonia. His body was wracked with cerebral palsy-- he was never able to walk or talk. Though not strong in body, he was strong in spirit. 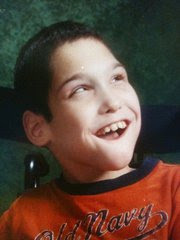 He loved his family and had a smile as wide as Texas and loved to give "kisses." People from all walks of life felt Christ-like love radiating from him. Kevin was a huge blessing to their family. They derive comfort that because the Savior died for us, we shall all live again. They will see and live with Kevin again -- they are an Eternal Family! May peace and comfort be with their family as they grieve and mourn the loss of their son Kevin. My thoughts and prayers to your family, Joni. My heart goes out to you and your family. I cannot imagine losing a child. My thoughts and prayers are with you and your sister's family during this hard time. Joni, My heart goes out to your sister's family, you and your entire family at this difficult time. Eternal families are such a blessing. May the family be buoyed up by prayers and find peace through the Savior. Sending prayers up for your family at this most difficult time. What a blessing to have had him for 17 years! God bless you and your sister's family at this difficult time! Nicely said! Such a beautiful post. Such a loss for your family. It sounds like his life was a blessing to all of you. I'm sending you all a prayer for peace over the next few days. May wonderful memories of your nephew provide comfort and may you be richly blessed because of your faith in Jesus Christ. My love to you and your family. Thank heavens for the gospel and our Heavenly Father's plan of happiness. Kevin is your future. Joni, how sad. My thoughts are with you and your family. I feel led to share with you a song that has given me great comfort when dealing with the loss of a loved one. Joni, Thinking of you. Thank goodness for faith in the atonement. My Heavenly Father bless and comfort you and your family. Oh how sad and sweet about your nephew Kevin. How blessed some of us are to have eternal families. Thanks for sharing this with everyone. So sorry for your loss, too! Thanks for sharing the beautiful scripture. You and the family are in our prayers! What a blessing to have had that sweet boy in your lives for as long as the Lord allowed.What love of Christ he must have taught you all. He is with his Lord and Savior, at peace, no pain or tears, he is praising and worshiping our Lord. Be happy for him. A beautiful post that I can tell came right from God's heart to yours. I'm sincerely sorry for your family's loss, Joni. I rejoice right there with you in his everlasting life. What a life he has now. Joni, I am so sorry. I pray for you and your family and Kevin's family, for strength and understanding, for healing. Kevin is now healed and whole and rejoicing in his life. Oh Joni. I am so sorry for your family's loss. you and your family deserve love and happiness. Joni, So sorry for your loss. Your family will be in my prayers. I have followed yours and your sister's blog and had no idea you were Laurel's Aunts. The loss of Kevin is very sad as he was the true essence of innocence.